The spot silver price edged higher yesterday confirming the recent positive sentiment towards the industrial metal and holding above all four moving averages once again. 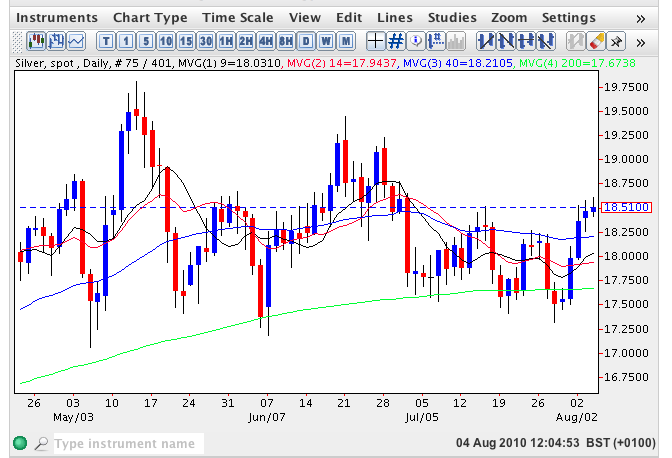 The low of the day found good support from the 40 day moving average suggesting that we should see a continuation of the recent upwards move in due course and provided we break above the $18.85 per ounce level then this should confirm a solid platform of support with a subsequent move higher as a result. Any break above $19.23 will open the way for an approach towards $19.81 and thereafter to $20 per ounce and beyond.